AmPhiFluex-LQ is a unique combination of the most advanced feed additive in the market in the form of a solution. AmPhiFluex-LQ contains a well-balanced patented formula of Vitamin B1, Vitamin B6, and selected synthetic amino acids. In addition, AmPhiFluex-LQ contains a proprietary mix of Pidotimod, Taurine, GABA (gamma amino butyric acid), Xylo-Oligosccharideds (XOS), and Methionen- Chelated Zinc. AmPhiFluex-LQ helps combat stress during disease, post-vaccination, and other stressful conditions. Pidotimod is an immune system enhancer, which promotes the animal's immune system to produce interferon and antibodies, which in turn help combat viral infection. Other ingredients in AmPhiFluex-LQ work synergistically to help improve the animal's appetite and capacity-increasing production and improving the physiological functions for faster recovery from illness. AmPhiFluex-LQ helps the animal in improving tolerance for symptoms associated with viral and bacterial infections. AmPhiFluex-LQ helps in the processes of excreting urea through the kidneys. AmPhiFluex-LQ also helps through improving the physiological functions of the animal to aid in neutralizing endotoxins and inhibit the endogenous inflammatory mediators (TNF), thus assisting sick animals survive severe sepsis and multiple organ dysfunction. AmPhiFluex-LQ shows synergistic effects improving antibiotics efficacy and complements microelements and vitamins, anti-stress. AmPhiFluex-LQ can be used before and after vaccination to promote the production of antibodies and maintain the animal's well-being. 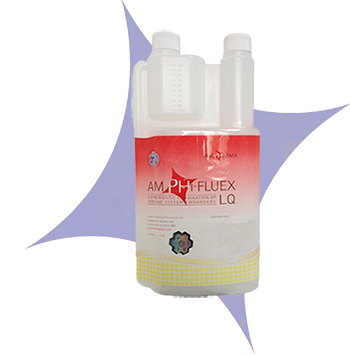 AmPhiFluex-LQ can be used as the prevention and adjunctive supplement during viral disease, especially immunosuppressive disease such as ND, IB, IBD and proventriculitis of poultry. AmPhiFluex-LQ provides excellent support in stressful conditions such as long-distance transportation, sudden change in weather, high temperature, during symptoms of growth and development retardation, weakened resistance against disease and infections, loss of appetite and weakness. AmPhiFluex-LQ can be given either alone or in combination with chemical or antibiotics, as recommended in severe cases. 100ml to 150L of drinking water or 100kg of feed for five to seven days of continuous use. 100ml to 200L of drinking water or 150kg of feed for five to seven days of continuous use. Vitamin B1, Vitamin B6, Zinc Methionine, Glycine, Lysine, Sodium Butyrate, Pidotimod (PDMD), Xylo-Oligosccharideds (XOS), Taurine and Gamma Amino Butyric Acid (GABA), and other proprietary micro ingredients, including RH 40 Cremophor, Propylene Glycol, BHT, Deionized Water and excipients.